This painting is very similar to the banana plant shown here. I soaked a piece of 140 lb cold press paper in water for about 5 min, making sure the paper is saturated ( a simple line drawing of Payton was already drawn on the paper). I then layed the wet paper on a sheet of acrylic and smoothed it out. I began my image by painting with watercolor as I had with the banana plant. 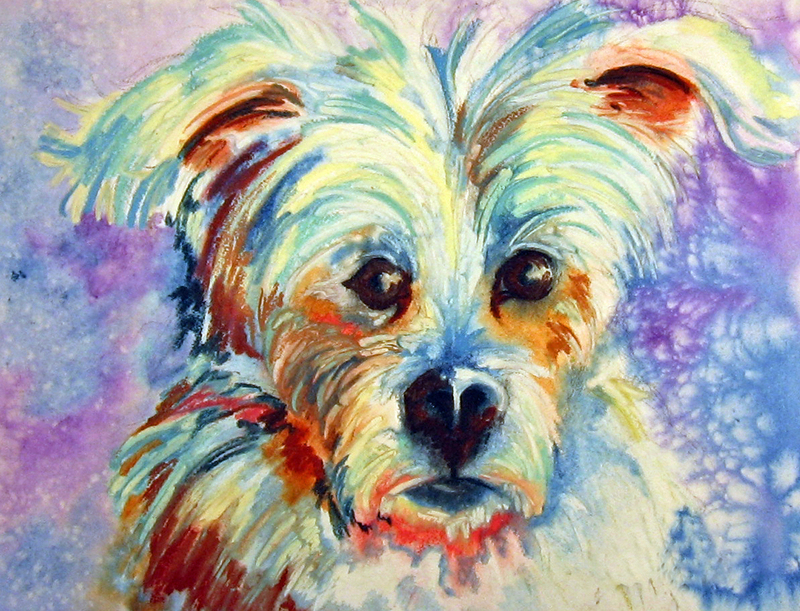 Then, to furthur describe Payton, I began working pastel into the soupy wet of the watercolors. Interesting effects occur when you do this. 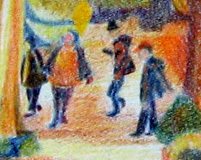 Sometimes the pastel blends with some of the soupy color and other times it acts as a strong resist. The pastel becomes super creamy in the water and easy to work into the image. 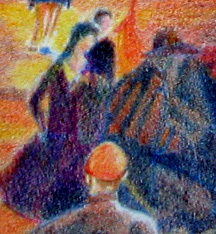 The interesting effects on the right side of the background was not salt but something the paper came into contact with when soaked, so you may have some of this. The one thing I had to watch for with this technique is to not build up one medium over the other and to let them compliment one another. 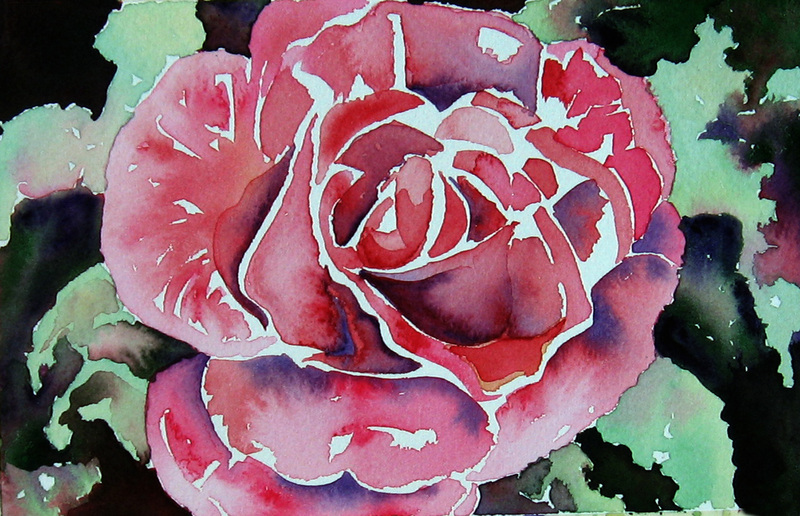 As the paper becomes more dry, your watercolor will go in with deeper color. Remember, when finished, to move the paper to another surface than the acrylic. If left on the acrylic, it could become stuck to it. Because of the pastel in this, I lightly spray my finished painting with fixative. I used nupastels and soft pastels, both, in this. My grand daughter pointed this guy out sitting among the bushes at the zoo. That’s how noticing this artist is. I struggled with this one, art friends. After I was halfway into it, I wished I had rendered him like I’d done the meerkat ( without an environment ). It was very difficult to get the blue I’d chosen to come forward from the background and then I felt I was too dark with the background. I went around and around with myself. I used salt for the patch of earth he is laying on. His mottled feathering and crest were done with the aid of liquid frisket. I hand painted the feathers on his tail and then took a wet brush over it in areas to make it look as though it’s receding in to the brush. 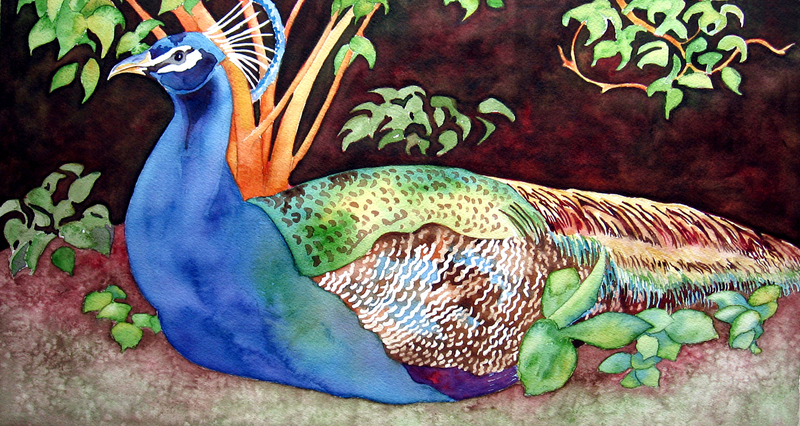 Deva has a lovely photo of a peacock posted on her blog. The above painting was painted with the help of salt. I first painted in all the color very wet letting the green, yellow and oranges run together some.While the paint was still wet, I sprinkled salt all over this. No, I did not shake it over the whole painting but put a mound in one hand and pinched some of that over the wet pigments.I sat and watched as it began to make little stars in the paint. I added more after about three minutes to areas where nothing was happening ( this may have meant the paper was too wet at the time I applied it ). What I was trying to do is develop texture in the leaves and brush. I waited for this all to dry, thoroughly, and brushed the remaining salt from the paper. Some of the salt stuck, so I rubbed a little harder. I painted the roadway wet-in-wet and darkened the curve at the end of the road with burnt sienna. Then with ink and drawing nib, I drew in and around the foliage to create the tree trunks and branches. I rendered this same scene by using a saran wrap print that I posted earlier here. 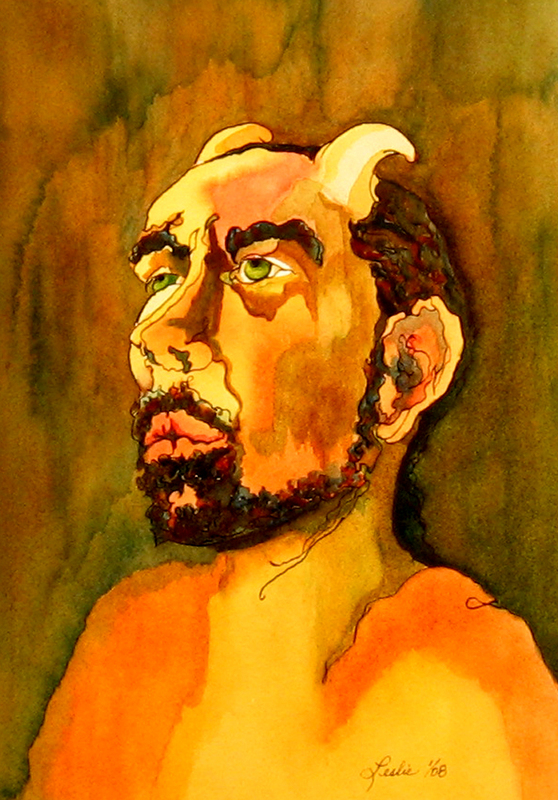 Joshua Sellers accepted this painting as an illustration for his post titled “This Road”. He has offered the opportunity for other artists and photographers to offer illustrations for his posts and here are the directions on how to submit. Thank-you Joshua. It never ceases to amaze me that a teacher is often taught by her students. On my first night of watercolor class this year a student asked, “You mean we have to do a drawing first?”. I think I answered something like I’d prefer that you did so you have a guide to follow while you learn to use the techniques and manage the water. That question nagged at me. Then I viewed a post on watercolor bubbles by June Malone. She had practiced using her new watercolors by painting bubbles. I saw no graphite in her images. I set aside time to try painting in watercolor without drawing first. 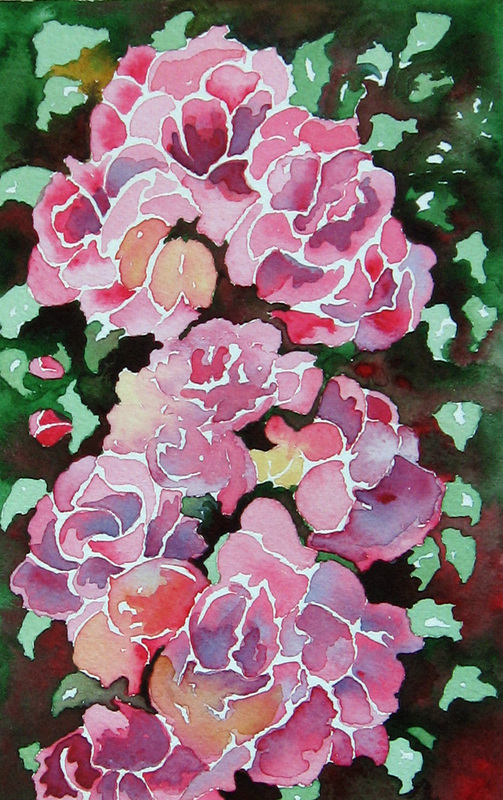 I chose flowers and concentrated on painting the shapes I observed. In order to stay organized as I painted, I worked the composition from the center out, hoping I’d have something harmonious in the end. The above two paintings were painted without drawing, first. 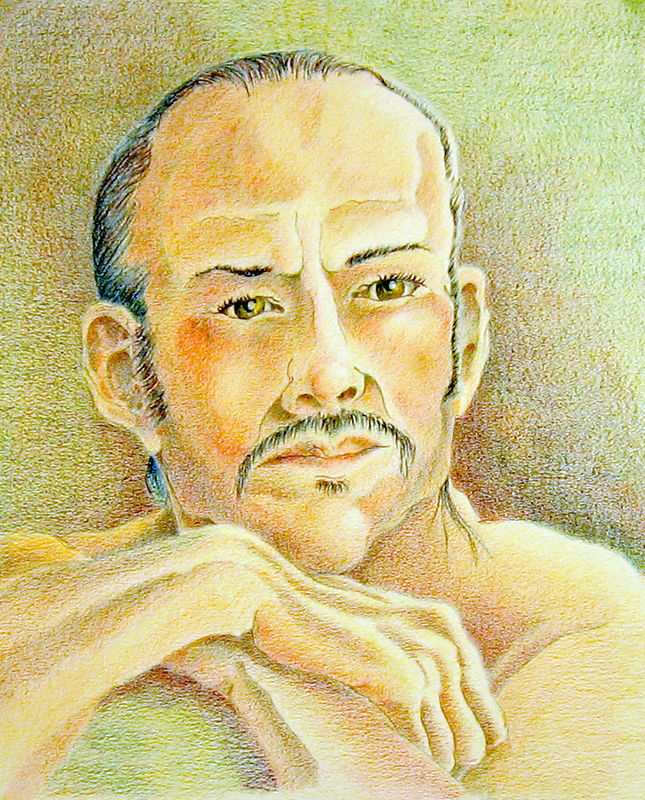 This is a colored pencil portrait that I completed from a drawing I had done of Tom at life drawing sessions. I wanted to see if I could finish a portrait, in color, from the knowledge I have gained from spending time studying people. This was the end result. I know it is always better to work from a subject, but sometimes they are not available for the amount of time it takes to finish something like this. I don’t think I could have done this with just any model. I have drawn and painted Tom more than any other model and I think that practice helped me with this. After June’s comment this morning about leaving the background on the Tom in colored pencil, I decided to post this Tom as the devil where I darkened and sharpened the background. I had posted him on my blog earlier. I do think it is part of what attracts me to art; this activity where I can manipulate what I see! 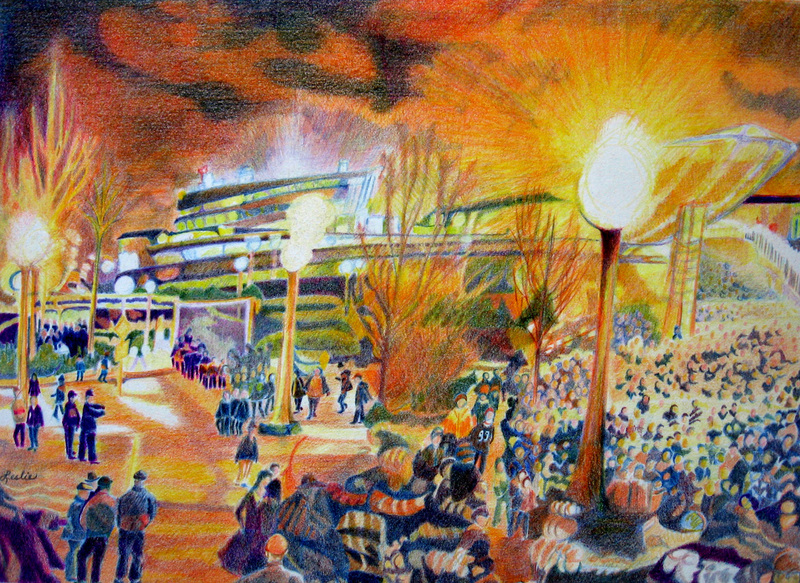 This was a landscape I challenged myself to do from a photo my son took after a Chicago Bears/Green Bay Packer game 2 years ago. At first it was great fun trying to lay everything in. But, oh my, the layers I had to add to get any depth at all. I tried to capture what the camera picked up in movement in the foreground. Rendering all the people piling off the ramp was another challenge. This is done in prismacolor colored pencils on Strathmore vellum bristol board. 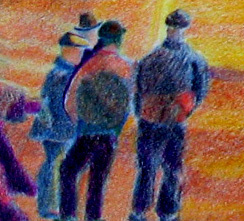 I did not know about the Stonehenge paper that I use, now, for colored pencil work. 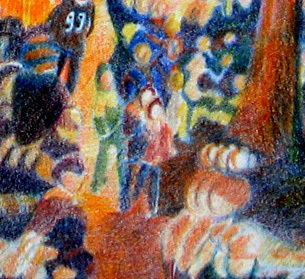 The other thing I noticed, today, were all the little people compositions within this, so I cropped them to share with you. “Bill” is our male lion at the Fort Wayne Children’s Zoo. 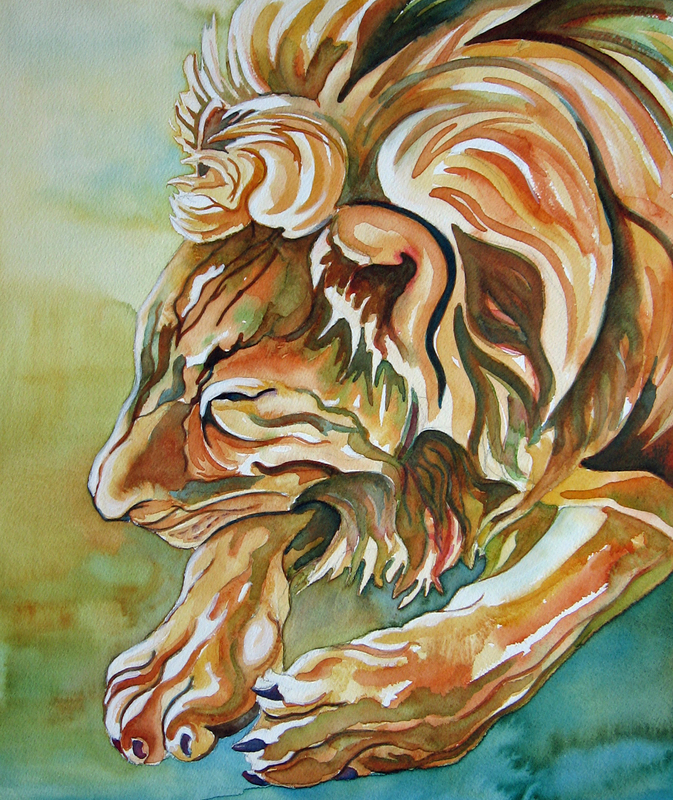 When I first started this project all I could think was, “Who would ever name a lion Bill?” Then I thought of WR Jones (Bill), an accomplished oil painter and master of story-telling on wordpress and the name seemed to fit. 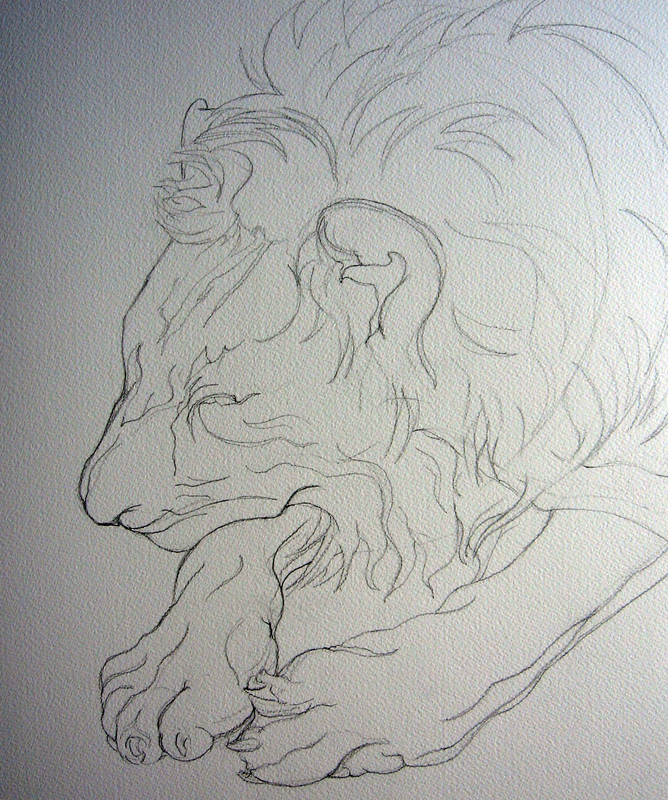 I have included my broken contour line drawing to show what I usually start with before I begin painting. You can see that my broken line drawings are influenced by my continuous line style. Here is “Bill” at his window. Thank-you idleloaf! 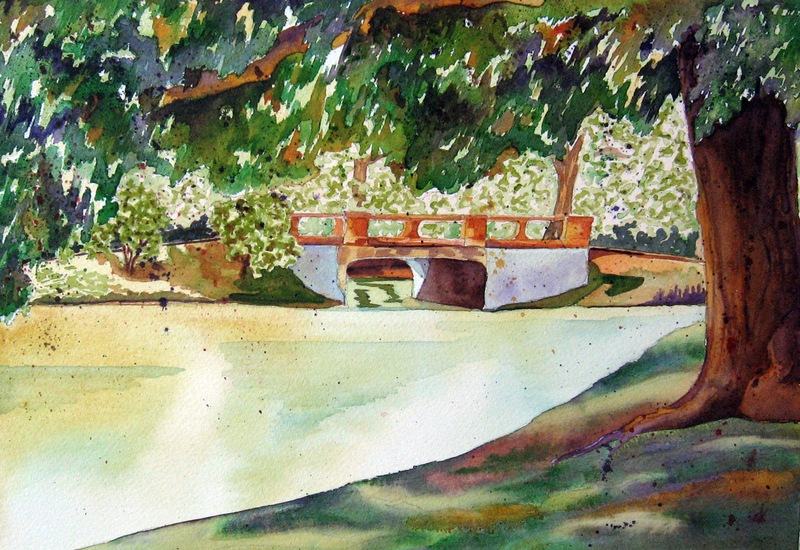 This is a landscape of the Columbia Street bridge by Lakeside park in Fort Wayne, Indiana. I was attracted to the shadow cast by the big maple tree and the light coming from the other side, brightening the water. A Taylor Made Life has included this image on his blog . Thank-you Joe! The difficulty I faced with this portrait was the white parts of his coat. In several other paintings, of this nature, I have done a light underpainting over the entire sheet of paper to give the white color and tone it down. This time I chose to leave the white of the paper and contrast it starkly with the rest of this dog’s coat because that is how he appeared to look. Sort of “look at me” attitude. 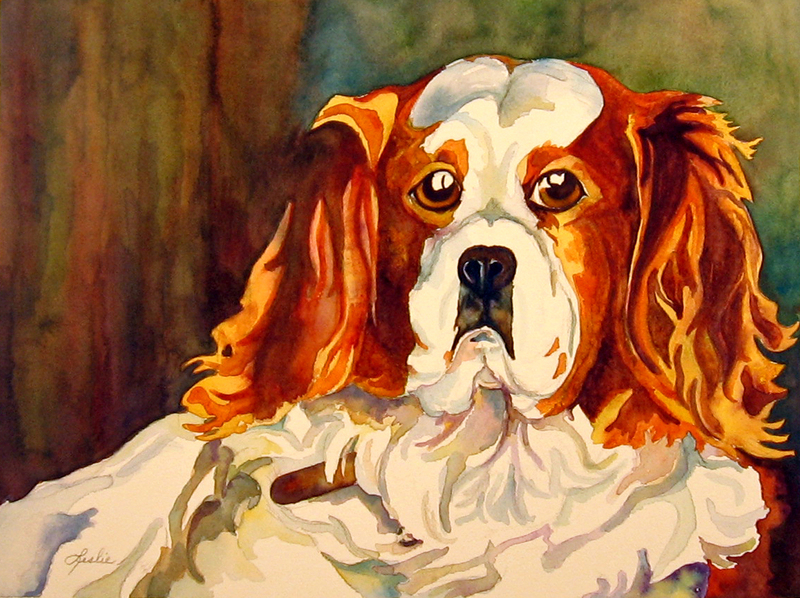 I used light washes of the colors from the background to shade and define areas of the white part of his coat. “Y” has just included a photograph of a puppy of this wonderful breed.